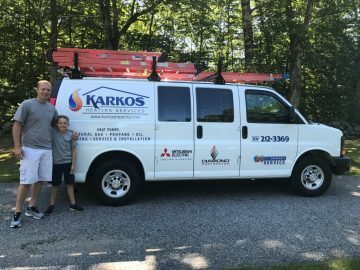 Josh Karkos began his career as a teenager working with his family in the HVAC industry in the Farmington, Maine area. He then began working with a small independent company out of Lewiston, Maine doing primarily residential work – where he stayed and learned much of his trade for 8 years. He then went on to work for a local commercial mechanical services company in Auburn, Maine. While working there, Josh had the opportunity to expand his knowledge base to include servicing and installing commercial grade systems. He began to start building his own business, working nights and weekends for his client base, which grew quickly by word of mouth. In early 2016, Josh left his previous employer to pursue building his company full-time, Karkos Heating.